President Donald Trump on Wednesday held up Intel's plan to invest more than $7 billion in an Arizona factory as a win for his economic agenda, but it's also a reminder that not all corporate commitments come to fruition. Trump was the second president to celebrate the computer chip maker's attempts to expand its domestic production at the same facility in Chandler, Arizona. In 2012, Obama went to the factory's construction site and celebrated that the plant would produce "some of the fastest and most powerful computer chips on Earth." "Let's stop rewarding businesses that ship jobs overseas," Obama said at the time. "Let's reward companies like Intel that are investing and creating jobs right here in the United States of America." But by 2014, however, Intel had pulled back from finishing the factory. The company said Wednesday that it expects to open the plant known as "Fab 42" within four years. "We delayed completion to ensure Fab 42 came online when we expected sufficient demand," said William Moss, an Intel spokesman. "We're making this investment now in anticipation of the growth of our business." Like Obama, Trump declared it a win for workers. "We're very happy and I can tell you the people of Arizona are very happy," Trump said. 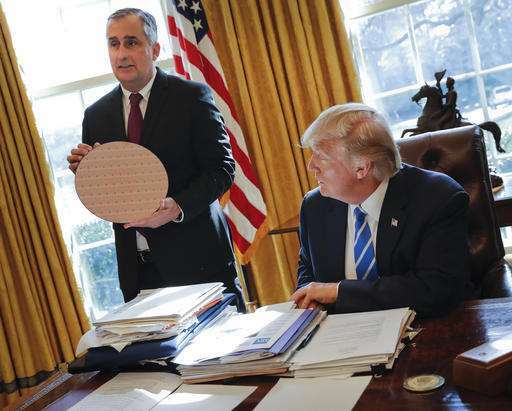 Intel CEO Brian Krzanich said in an Oval Office visit with Trump that the factory will employ about 3,000 workers directly —and 10,000 workers in Arizona in support of the factory. Krzanich said he made the announcement from the White House because "it's really in support of the tax and regulatory policies that we see the administration pushing forward." But Intel has not been a universal fan of Trump's policies. It was among the tech companies that filed a legal brief that challenged the president's 90-day ban on travel to the United States from seven Muslim-majority countries. The announcement comes as Intel has shed jobs. It announced last year that it planned to lay off 12,000 workers in a reorganization prompted by a decline in sales of personal computers. That was about 11 percent of the company's workers. BTW I was thinking about all our past presidents. How many of them had even a 1/5th of the achievements of President Trump before they became president? Owns or significant interest in over 500 companies. Host of popular TV show. Non of us could achieve this in 10 lifetimes at our current rate of progress. I would not trust them. Intel is a rotten company. Lots of advances, just as many evil machinations to maintain top place in the industry no matter what it did to the progress of the industry. They've been accused of paying off end users to exclude other components from their rivals. If it hadn't been for AMD and others, we'd still be using 486 processors at $1000 a pop. Ever since the media jumped on Trump this county's people have forgotten "innocent till proven guilty". BTW I don't disagree with you about Intel. That look on his face, you can hear him going....mmmmmm....waaferrrrr. BTW. Totally balding in that pic. Wow, I agree with you antigoracle! I can't believe it, a 70 year old losing his hair! I am just glad you and I have no major defects. None of us could achieve this in 10 lifetimes at our current rate of progress. What a surprise, that it's totally lost on you, the poorly educated, how ridiculous that claim is. So are you claiming to be a billionaire? ? Just exactly which one of those achievements can you claim for yourself? You notice I just said one, not 5 like are listed here for Trump. Trump's only achievement, is his capacity to speak "retard", which he used to exploit the uneducated like you to get the Whitehouse. Now him and those who funded him are going to raid the country's coffers, not of millions, but billions. And, guess what, at the end you'll still be the enamoured idiot. Now there is real jealousy! Talk about envy! While you never wrote a book, let alone one that was on the best sellers list, I like your posts. :-) I guess any attempt you make at writing is better than nothing. If I understand you President Trump is dumb because he used the word "retard", but vary educated of you to use the word idiot. Trump's dad was a multi-millionaire who gave his son loans, gifts, business connections, a large inheritance, and illegally purchased $3.5 million in gaming chips from his son's casino without using them. We should all be so lucky. Snooki also became a popular television personality. Television is the lowest common denominator of our culture.